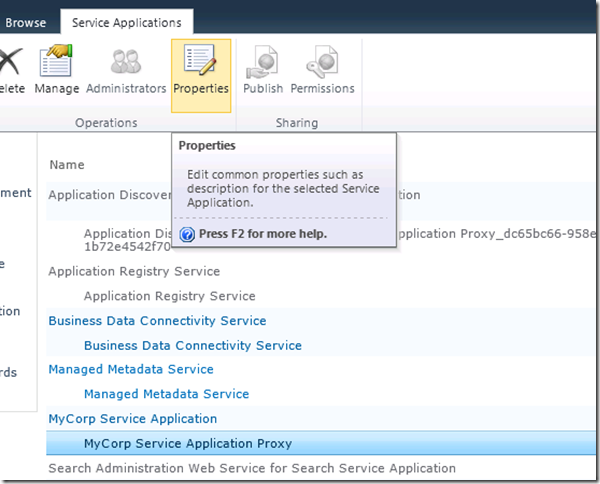 Service applications in SharePoint have Properties pages. You have complete control over these. 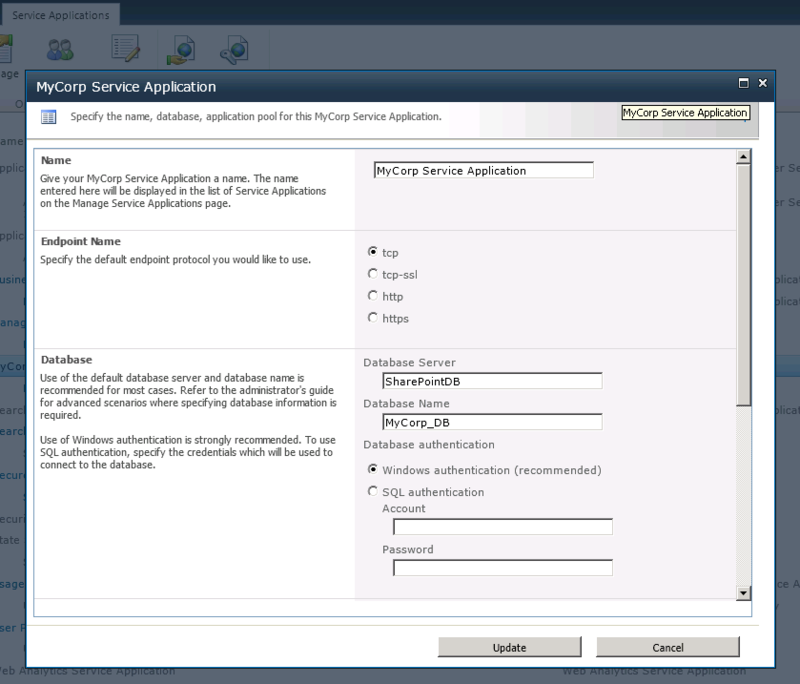 In this sample service application, I added the option for administrators to pick the endpoint protocol they would like to use in their service calls. 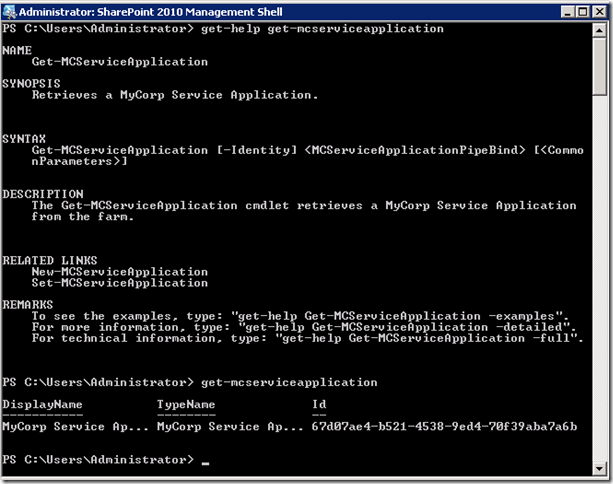 This is also how you manually create the service application, where you specify the application pool to use (or create a new one), and also provide the server name and the name of the database(s) to use in support of your application (I like to setup my servers with aliases, so in the screenshot below: SharePointDB is actually pointing to a SQL Server instance, many consider this a best practice with SharePoint – 101 tip). 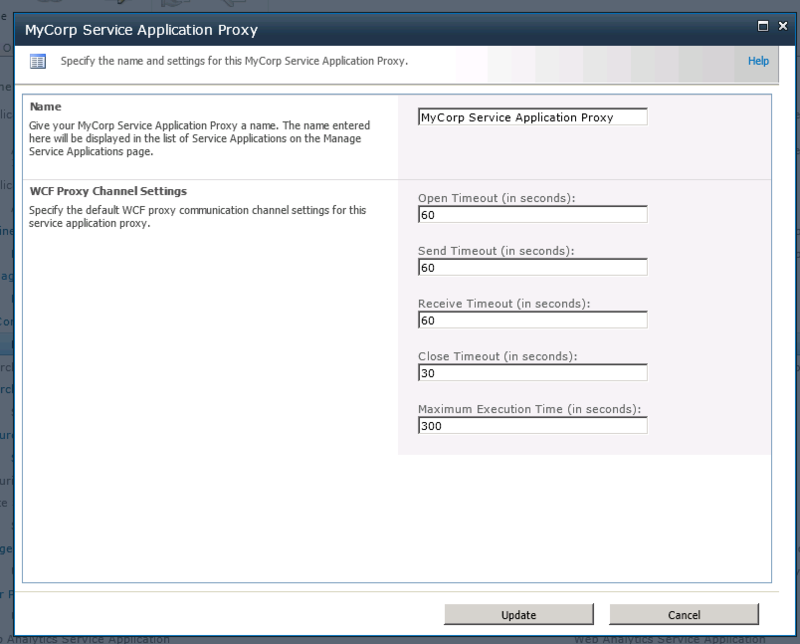 The same is done for the service application proxy. 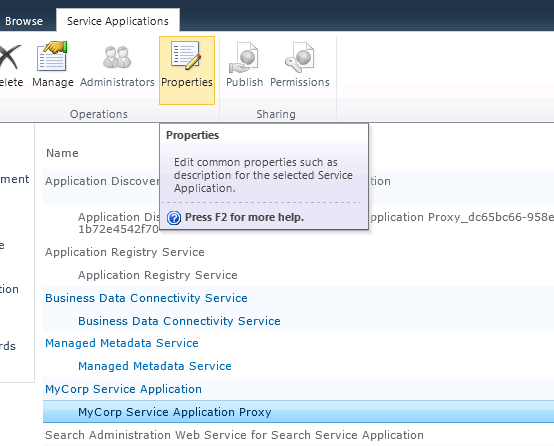 Just click on the MyCorp Service Application Proxy and click on Properties. You’ll now be able to change various timeout settings and default settings for your WCF channel communication. 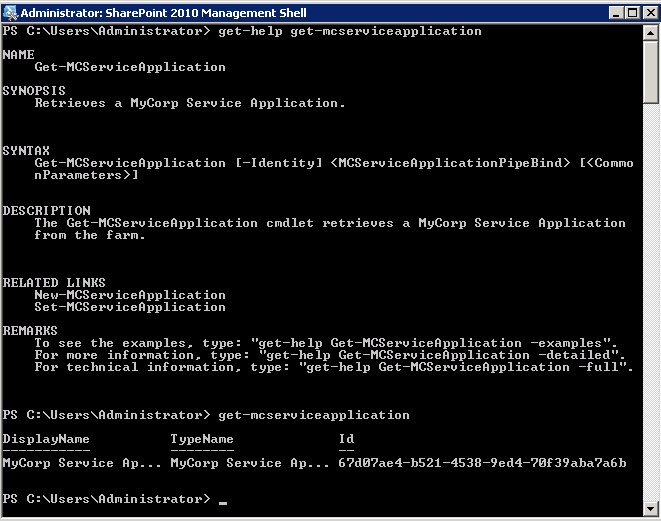 You can also manage your service application and it’s properties using PowerShell. I added some basic PowerShell commands to the project (download is provided at the end of this post) that will appear upon deployment in your SharePoint powershell console. And it’s a good practice to also include a help file so that users have all the info needed to know how to use the cmdlets you’ve written. The help file for the 3 cmdlets is also in the download. In the last 4 posts, we created a complete service application infrastructure to integrate 3rd party systems and/or build custom enterprise applications within your SharePoint farm. I’m going to hunt down a simple 3rd party system (something I haven’t played with yet) that I can showcase to give an example of how you can use this infrastructure in the way I describe. But if you’ve been following this series, I’m sure you already get the idea, but I think this will be a nice way to wrap up the series. You are describing nice information abut manually create the service application but if user do not have any application pool or how to create it.so that user can go ahead. 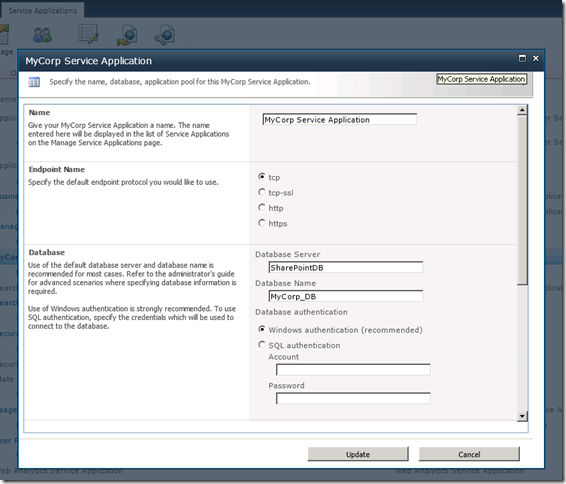 The ServiceStack for Sharepoint article was a great help – i used it with success. Thanks for that! I wanted to use xSockets.net as a SharePoint Service, but for now i have to take a step back to understand what to do to write a Service Application – and it will take some time to understand what is going on in your code. I only wanted to say: Thank you for the great work! Hey Thomas, glad the ServiceStack blog post helped. xSockets.net looks super cool, that specific project is new to me, I’m going to take a closer look at it. I downloaded their demo app and fired up a couple different browsers to see the real-time updates, very nice! Have fun with your service app project. I’m going to try to wrap this series up shortly and hopefully clear up any lose ends.